Come along to one of our energetic and friendly classes! For some extra guidance or motivation see one of our fantastic 'life changers'! A full range of easy to use pin loaded equipment! A wide variety of cardio equipment from stair-masters to treadmills! Fit 4 Life’s very own mini-trampoline based exercise class. 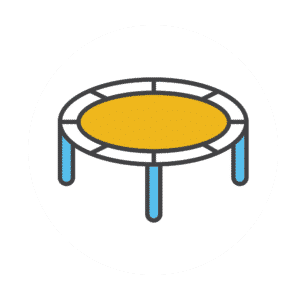 With 10 trampolines available for our members to get their bounce on, not only does it burn fat like you wouldn’t believe, but it helps tone your legs for a great lower body workout! The ever popular spin class that you’ve been looking for. Another fantastic calorie burner and leg worker, whether it be a series of sprints or a long uphill haul, spin will have it all! People think gym is all about lifting big weights and getting shredded, but your flexibility, range of motion and mentality all need to be in the right place too, and that’s where yoga comes in! The perfect blend of inner zen, stretching for flexibility and increasing your ROM. Whether it’s to work on bettering yourself, or just to wind down after a hard day, yoga is what you need! All personal training packages run for a minimum of 12 weeks. 24/7 gym access, unlimited classes and a free personal training sessions included! 24/7 gym access, unlimited classes and a free personal training sessions included! 2 week notice of cancellation required. 24/7 gym access, unlimited classes and 1 personal training session each week! 24/7 gym access, unlimited classes and 2 personal training session each week! 24/7 gym access, unlimited classes and 3 personal training session each week! 24/7 gym access, unlimited classes and 4 personal training session each week! 24/7 gym access, unlimited classes and 5 personal training session each week!